PH meter is an electronic device that serves to measure the pH (acidity or alkalinity) of a liquid (there is a special electrode that serves to measure the pH of semi-solid materials). A pH meter consists of an electrode (measuring probe) connected to an electronic device that measures and displays the pH value. this tool is very useful for drinking water industry, laboratory, aquarium, apparel industry especially batik and dye clothes. 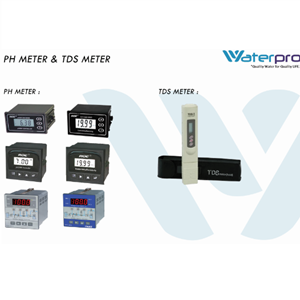 TDS Meter is a tool for measuring the solute depicted in units of Part Per Million or PPM.